"The Bee Gees... sound like talented musicians... being scalded to death." The Bee Gees are a controversial band to talk about these days, because either you love them or you hate them. Whatever the case, it isn't considered cool to like them, even though they have had a significant career in the music industry. The Bee Gees' name is commonly believed to be short for "Brothers Gibb", though it's actually a reference to Australian DJ Bill Gates (no, not that Bill Gates) and promoter Bill Goode, two men who played key roles in launching the group's career. The Bee Gees for most of their history have consisted of twin brothers Robin and Maurice Gibb and older brother Barry. (Youngest brother Andy Gibb is commonly believed to have been a member of the Bee Gees, but he never was.) British by birth, the brothers were living in Australia when they began their musical careers, though they had moved back to Britain by the time they hit it big. They first came to prominence in the late 1960s as a harmonic rock group, characterized mainly by their three-part harmonies led by Robin Gibb's vibrato. Their first international hit was "New York Mining Disaster 1941" (1967); other hits from this period include "To Love Somebody", "Holiday", and "Massachusetts" (the last of these being their first UK #1 hit). These songs and several others today are staples on oldies stations. The band at this point actually consisted of five members. In addition to the Gibb brothers, the group also included guitarist Vince Melouney and drummer Colin Peterson. The band's first three albums (excluding a couple of Australia-only releases), Bee Gees' 1st, Horizontal, and Idea, were all popular successes. However, tensions began to boil during the recording of the group's next album, Odessa. Though the album today is considered one of the finest of their early period, it was a cause of great strife for the band. Robin began to feel that the label was favoring Barry's songs when it came to choosing singles, and finally left the band to pursue a solo career. Peterson was fired during sessions for their next album, and with Melouney having left previously to pursue a different musical direction, the Bee Gees at this point were a duo consisting of just Barry and Maurice. The album Cucumber Castle was a flop, and with the group in a state of chaos at this point, it was seemingly the end of The Bee Gees. Then in late 1970, Barry and Maurice managed to patch up their rift with Robin. The three decided to reunite and give the Bee Gees another try, strictly as a trio this time. 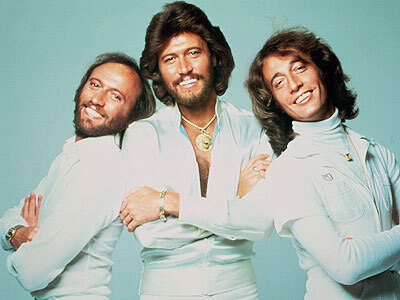 Not long after their reunion, the Bee Gees recorded two of their biggest hits, "Lonely Days" and "How Can You Mend a Broken Heart", the latter providing them with their first US #1 hit. After that, however, their commercial fortunes dropped sharply, as their next few albums sold very poorly. Deciding they needed a change in their sound, they teamed up with Arif Mardin and recorded the album Mr. Natural, which saw them infusing their trademark sound with elements of R&B; though the album was not a big seller, it did show that the group was starting to find themselves again artistically. They finally saw commercial success again with their next album Main Course, also produced by Mardin. In addition to providing them with their first number one hit in four years, "Jive Talkin'", the album also featured Barry's first attempts at singing falsetto, a sound the group is heavily identified with today. When it came time to produce their next album, Mardin was not available, so the band began producing themselves. The resulting album, Children of the World, was another big hit, spawning another number one single, "You Should Be Dancing". It was then that Robert Stigwood approached the Gibbs about contributing songs to the soundtrack of a new motion picture that was being produced. The project, which would focus on the disco scene, excited the Gibbs, and they happily agreed. The Saturday Night Fever soundtrack would quickly catapult the band to the peak of its popularity, even more so than they had been in their pre-disco days. Because of the incredible success of this album--for a time, it was the biggest-selling album in history until that role was taken by Michael Jackson's Thriller--The Bee Gees, fairly or not, became the poster boys of the disco era. Despite this, disco songs were hardly The Bee Gees' only hits, even in this era; non-disco ballads like "How Deep Is Your Love" and "Too Much Heaven" were just as big of hits as "Stayin' Alive", "Tragedy", "Jive Talkin'", and "Night Fever". Their last big hit of the 1970s, "Love You Inside Out", was more of an R&B song than full-on disco. Whatever the general vocal ranges of the songs were, though, one thing that remained from their harmonic rock period was their tight vocal harmonies, although this time with Barry Gibb taking more of a lead role. As the 1970s became the 1980s, the group updated its sound once more to stay contemporary, shifting from straight disco to R&B-based pop. However, the US continued to regard them as relics of the disco era, and with the backlash against disco running strong, the group would find only occasional success in the studio from here on out -- most notably the 1989 single "One" (their last U.S. Top 10 hit) and the 1997 album Still Waters (which sold over 4 million copies in the States, and spawned their last top 40 hits, "Alone" in the summer of 1997 and the title track in January 1998). They remained popular in the UK, though, and experienced continued popularity behind the scenes writing songs for other people even in the US. Songs they wrote for others include Barbra Streisand's "Woman in Love", Dionne Warwick's "Heartbreaker", and "Islands in the Stream" by Kenny Rogers and Dolly Parton. In 1997, with Barry Gibb struggling with arthritis and back pain, the group played a show titled One Night Only, intending for it to be their last. Response to the show was so overwhelmingly positive, however, that Barry decided to soldier on with one last full-scale tour despite the pain. That same year saw them inducted into the Rock and Roll Hall of Fame. Brian Wilson of The Beach Boys, who himself knew a thing or two about vocal harmonies, performed the induction. 2003 saw the temporary end of The Bee Gees, with Maurice Gibb's sudden death at the age of 53 of a heart attack. After that, Barry and Robin performed off-and-on under the Bee Gees name, including appearances on Dancing With the Stars and Strictly Come Dancing in late 2009. In May 2012, Robin Gibb passed away following a long battle with cancer, leaving Barry as the only surviving member and effectively marking the end of the group. Always Identical Twins: Averted with Robin and Maurice. They are fraternal twins, and never looked even remotely alike -- Robin was a fine-featured Pretty Boy, while Maurice was more average-looking with prematurely thinning hair. Baroque Pop: Most of their 60s output, chiefly Bee Gees' 1st through Odessa. Briefer Than They Think: Out of their 50+ years in the music business, only five of them were spent as a disco band. Canon Discontinuity: "Spicks and Specks" (the song only, not the album) is the only thing from their Australian days that the Gibbs really acknowledge. Various compilations of pre-1st material dot record store shelves, but these are distributed by small independent labels and not officially sanctioned by the Bee Gees or Polydor Records, their longtime record label. Carpet of Virility: Just look at the picture up here! Chronological Album Title: Bee Gees' 1st was technically their third album, but it was their first to be released internationally. Cover Version: They covered quite a few Beatles songs, such as Ticket To Ride and Paperback Writer. Determinator: Barry Gibb during the last full-scale tour. To some extent, the entire band during lulls between the high points, and following the death of their brother Andy Gibb, himself a successful solo artist, in 1988. Everything's Louder with Bagpipes: "Alone". Follow the Leader: Bee Gees' 1st was very much in the mold of Sgt. Pepper-era Beatles, just quirkier. On the flip side, ELO tended to change their styles to match whatever the Bee Gees were doing. Grief Song: 1989's "Wish You Were Here", written after the death of brother Andy. I Am the Band: Barry Gibb is the only member to have been in every incarnation of the Bee Gees; Robin dropped out for a time in the early '70s, and Barry and Robin played together briefly following Maurice's death. Indecipherable Lyrics: They were very prone to this due to their unique singing style, particularly the songs where Robin sings lead. It Is Pronounced "Tro-PAY": It's "Morris", not "muh-REECE". Keep Circulating the Tapes: Their unreleased 1973 album A Kick in the Head Is Worth Eight in the Pants, is a highly sought after collector's item. It was recorded at the group's lowest ebb of popularity, and the record company, smelling another flop, refused to release it. It still hasn't been given a proper release to this day, which is quite a shame because musically, it's a very strong album, albeit rather on the somber side. If you just want the music, their 1981 album Living Eyes is easy to obtain, as it's available for download from a variety of sources. However, if you want an original CD copy of the album... good luck. It was one of the first compact discs manufactured and released; however, the format was in its infancy, and by the time the CD became the dominant music format, the album had long fallen out of print. To date it has never been reissued, and is extremely rare. Long Runner Lineup: Type 3. Lyrical Dissonance: Tragedy is an upbeat, dance-able song whose lyrics speak about a man about to cross the Despair Event Horizon because of his loneliness. The Movie: Saturday Night Fever is essentially the movie of The Bee Gees. Murder Ballad: "I've Gotta Get a Message to You". New Sound Album: Main Course marked the point at which they became a disco band. Living Eyes marked the point at which they stopped being a disco band. Non-Appearing Title: "New York Mining Disaster 1941", though some pressings include the chorus ("Have you seen my wife, Mr. Jones?") as a subtitle. A number of early album tracks do this. "Marley Purt Drive", "The Earnest of Being George", "Horizontal", "Portrait of Louise", and "I'm Weeping" are examples. Pop Culture Osmosis: Most young people only know the Bee Gees' song "Nights on Broadway" as the theme of the recurring "Barry Gibb Talk Show" sketch on Saturday Night Live but with different lyrics like instead of Standing in the dark/where your eyes couldn't see me it's Discussing politics/And the issues of the day. Signature Song: "Stayin' Alive" will always be the song most associated with the band. However, they have mixed feelings about it despite its popularity, as it resulted in their disco Typecasting. Final verdict: if someone wants it, it can't be used for anything related to disco. Over the years, directors have decided that this is the perfect song for Power Walks. In addition, it turned out that the beat of Stayin' Alive is the best rhythm for applying compressions for CPR (being 103 beats per minute). Something Something Leonard Bernstein: "Somethinganda somethinganda somethinganda somethinga staaaaaylin' alive! Stayin alive!" For the record, the actual lyrics are "Whether you're a brother or whether you're a mother you're stayin' alive! Stayin' alive! Feel the city breaking and everybody shaking they'll be stayin' alive! Stayin' alive!" Step Up to the Microphone: "Such a Shame" from their 1968 album Idea, written and sung by Vince Melouney, is the only song on a Bee Gees album not written or sung by a Gibb. Twin Telepathy: Robin and Maurice have claimed to have this. What Could Have Been: In the late 80s, there was talk of youngest Gibb brother Andy Gibb joining the Bee Gees, making them a quartet for the first time since their late 60s harmonic rock period. Andy's untimely death at the age of 30 in 1988 meant this would never come to pass.